Edward “Blackbeard” Teach was a notorious pirate of English birth who began his illustrious career around 1713. He became a crew member on a Caribbean sloop under the command of a pirate named Benjamin Hornigold. In 1717, Hornigold was offered general amnesty by Queen Anne and ended his days as a pirate. Teach, who had shown great promise under Hornigold’s tutelage, took over his command. This is when Teach morphed into the formidable “Blackbeard”, the most dangerous and merciless pirate to sail the Caribbean. 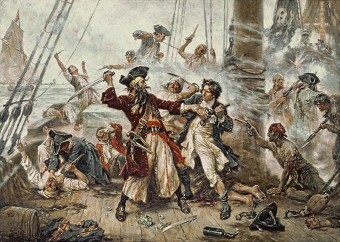 To make himself appear even more menacing, Blackbeard would often tie lit fuses in his beard and hair, causing his head to be surrounded by a cloud of smoke while he was engaged in battle. Over the next six months, Blackbeard’s ship, which he had re-named the Queen Anne’s Revenge, was the flagship of a small pirate fleet consisting of four vessels carrying approximately 200 men. He was at the height of his notoriety and power, terrorizing the Caribbean and the southern coast of America at will. When anyone encountered Blackbeard’s flag of a skeleton striking a spear through a heart, they simply surrendered and handed over their cargo rather than risk their lives. With the pardon in hand, Blackbeard took this chance to settle down a bit, marrying a plantation owner’s daughter and building a home on Ocracoke Island. But haters got to hate, and there were sailors and merchants that didn’t want Blackbeard haunting the waters of the area anymore. He’d mellowed out a bit, but he was still a pirate after all, even with gubernatorial sanction. Suspecting Blackbeard was in cahoots with Governor Eden, they took their complaints to Governor Alexander Spotswood of Virginia instead. He ordered Lieutenant Robert Maynard to send a British naval force to contend with Blackbeard in North Carolina. 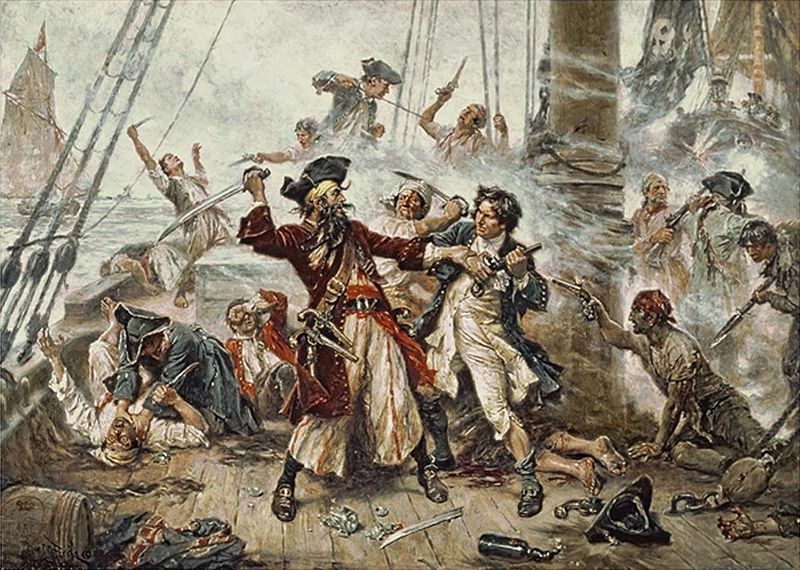 On November 22nd, 1718, Blackbeard’s forces were crushed, and after a long, bloody struggle, Blackbeard himself was vanquished, but it reportedly took five musket balls and twenty sword lacerations to bring the mighty pirate down. On October 28, 2013, after nearly 300 years deep under water, five cannons from Blackbeard’s flagship the Queen Anne’s Revenge were discovered by researchers from the North Carolina Department of Cultural Resources, who were working in tandem with the Coast Guard. The guns, which were brought to the surface of Beaufort Inlet, weighed in at 2,000 – 3,000 pounds.